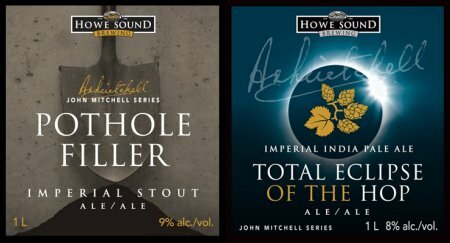 SQUAMISH, BC – Howe Sound Brewing has announced the return of two popular beers in the “John Mitchell Series,” a rotating line-up of of seasonal brews named for the original brewmaster at Howe Sound, and one of the pioneers of Canada’s craft brewing industry. A strong, thick, black imperial stout brewed with six varieties of roasted malt, wheat, blackstrap molasses, five varieties of hops, yeast and Coast Range water. Named in recognition of the women and men who constructed the Sea to Sky Highway, from Horseshoe Bay through Squamish, Whistler and Pemberton. (9% alc/vol & 65 IBUs). A high gravity India Pale Ale brewed with 100% barley, six varieties of hops, water and yeast. Extra barley malt nicely balances the huge volume of hops in this brew. (8% alc/vol & 90 IBUs). Both beers will be available at the Howe Sound brewpub on draught and in 1 litre swing-top bottles in the “big orange fridge” for take-home sales. Total Eclipse will also be available in BC Liquor Stores across the province.